Note: I first wrote about this many years ago in The Tico Times, but it seems not much has changed since then, and it is time to rethink our actions once again. Bragging is part of human nature. We all do it, no matter what activity we partake in. I’ve seen bird-watchers nearly exchange punches as they reviewed their sighting scorecards at the end of the day, accusing each other of inventing the number of different species they saw. Fishermen, I believe, were born with a more dominant bragging gene than most of the public. For any type of bragging, photographic proof is the most convincing tool of all. Thus, the “hero shot” was born. The traditional hero shot shows an angler posing in front of the camera with a giant smile, proudly displaying in his hands – or on his lap, if the fish is too heavy to lift – the trophy he or she has caught. If one is keeping the fish as a food item, it doesn’t much matter how you take the picture, because the fish is going in the icebox. If the fish is going to be released, however, it is a different story altogether, especially a fish the size of a sailfish or marlin. As 90 percent of anglers coming to Costa Rica are after sailfish or marlin, and all sailfish must be released by law, let’s talk about these species. 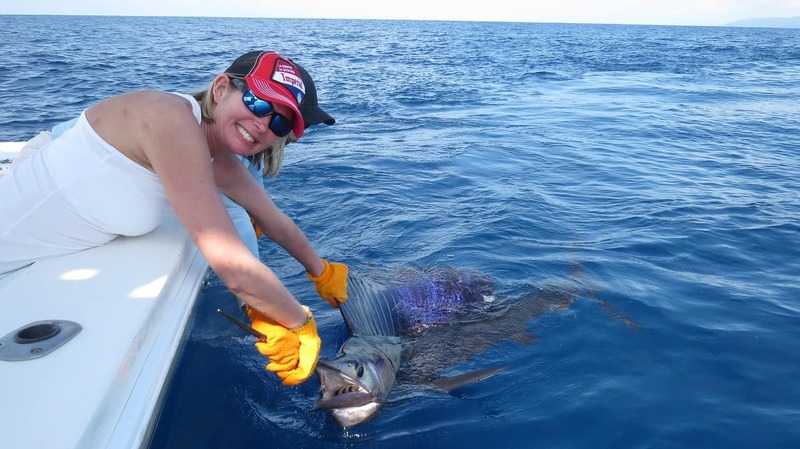 You can go to almost any website that features fishing in Costa Rica and see photos of sailfish being dragged across the gunwale of the boat and posed with the angler for the “hero shot.” Then the fish is put back in the water. This had been the norm for more than two decades. 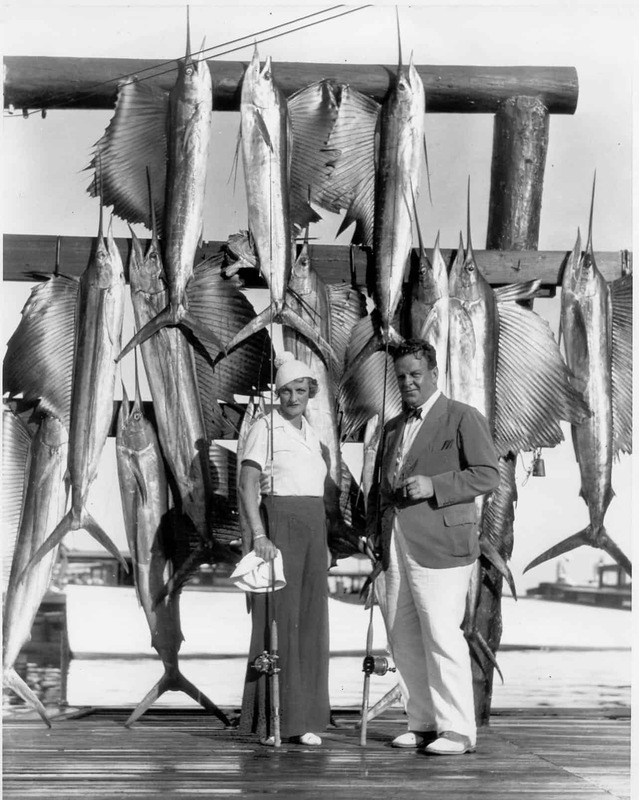 Most marine biologists agree that pulling the fish overboard for pictures can severely harm the fish. Air exposure reduces intake of oxygen and offload of carbon dioxide, which causes stress to the fish. Dragging a big fish across the gunwale can damage internal organs as well as remove the protect slime making them susceptible to bacteria and parasites. Over eight years ago, in December 2008, Costa Rica passed regulations making it illegal to remove sailfish from the water for the purpose of taking a photo. A fine of ₡2 million (around $3,500) can be imposed on those found in violation. For the most part, this regulation has been ignored by the sport fishing fleet for various reasons. First, I’d bet you a boatload of ballyhoo most people don’t even know this regulation exists. Website and brochure photos with happy people posing with big sailfish out of the water sell fishing trips, just like years ago a bunch of dead fish hanging at the dock sold trips. 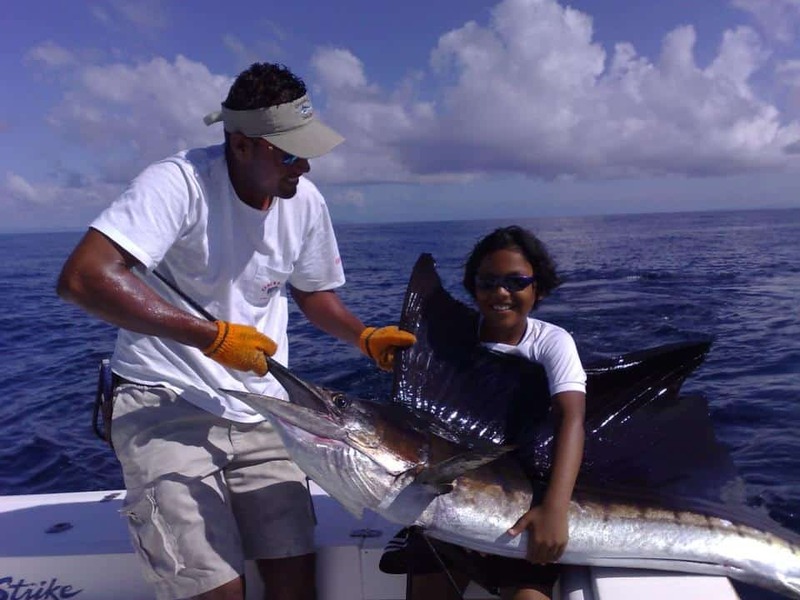 When tourists see these types of photos advertised, they want to bring home their own hero shot, with the sailfish onboard, to show all their friends back home. Fishing crews oblige them in hopes of getting a good tip. A good crew does an orientation with the client before leaving the dock. This includes discussing the boat’s safety equipment, the level of the angler’s experience and how we fish billfish in Costa Rica. I have found that when clients are informed before leaving the dock that removing billfish from the water is not permitted in Costa Rica, and why, they are very receptive. A good owner or manager insists that his or her crews give a good introduction. Good communication is a big part of the whole experience, and it should start at the dock. The Costa Rica government is finally starting to get its feet wet in marine conservation that is long overdue. So far, all their major decisions have continued to allow sport fishing in the new management areas. The Costa Rican Fishing Association (FECOP), a sport fishing advocacy project that started with President Laura Chinchilla, has protected over 200,000 square kilometers from tuna purse sein activity as well as moving them 45 miles from shore. Sport anglers have reported better tuna fishing as well as larger pods of spinner dolphins which are often associated with yellowfin tuna. FECOP is currently investing more than $100,000, and the government even more, in a joint project with INCOPESCA and the National Training Institute (INA) to teach the use of “Green Sticks,” a selective type of commercial fishing for tuna which eliminates bycatch of sailfish. This also includes proper handling of the catch to receive the best market price. The regulations are far from perfect in this country, and way too many billfish die each year as bycatch in commercial operations, but that does not give us the right to not follow the regulations in place. It is not difficult at all to leave them in the water and still get a good hero shot. Taking a good photo of a billfish: After your crew has a calm fish alongside the boat. 1. Leave it in the water. 2. Have your camera ready. Most people want a shot with their own camera, so make sure your friends know how to use it. Valuable time is wasted explaining how to use it and the chance of a bad photo increases. 3. Always touch a fish with a pair of fishing gloves on. Lean over and gently place one hand on the bill and the other hand on the dorsal fin. 4. SMILE and click. All this can be done in less than a minute if you are prepared. 5. Then you can either pass the fish back to the crew or hold it yourself while the boat moves slowly forward to pass water over the fish’s gills. When you can feel the fish resist, gently push it away from the boat and watch it swim away. 6. High-five your friends and crew and keep fishing.